We’re all a little bit weird, I know I am. We all have our idiosyncrasies. There are aspects of our personalities that we hope no-one knows about us. And there are things that we do that annoy other people that we aren’t even aware of. The challenge is to not to become so fixated on our own strangeness that we define ourselves by them and underestimate our capabilities. And similarly, the world would be a better place if we were all kinder to the people around us and more understanding of their flaws. 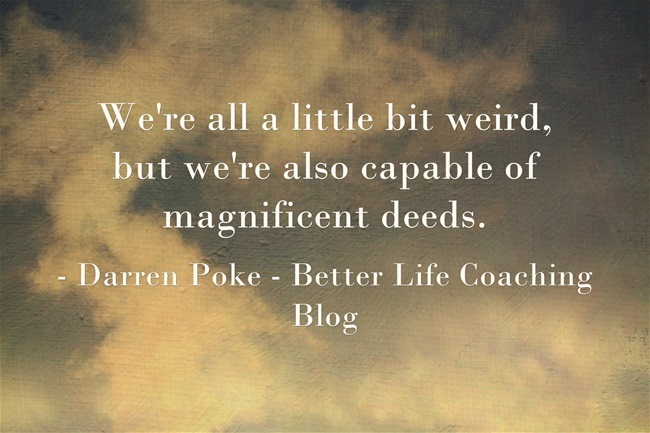 Because we’re all a little bit weird, but we’re also capable of magnificent deeds. Despite our strangeness, we can change the world. Despite the pain in our past, we can plan for a wonderful future. Despite our sins, God has a wonderful plan for our lives. So please, forgive me my weirdness and I promise to forgive yours.